“Egbert, King of Kent, with the consent of his nobles and princes, gave ten ploughlands in Halling, with all their appurtenances, together with the fields, woods, meadows, marshes, fishing and hunting and fouling belonging to them to Bishop Doran and the Church at <?xml:namespace prefix = st1 ns = "urn:schemas-microsoft-com:office:smarttags" />Rochester.” (Edward Hasted – History of Kent). Gundulf, who was Bishop from 1077-1108 built the first stone church. For the next 800 years the vicissitudes of the Church reflect in some instances the history of England. There were periods of neglect and periods of recovery. 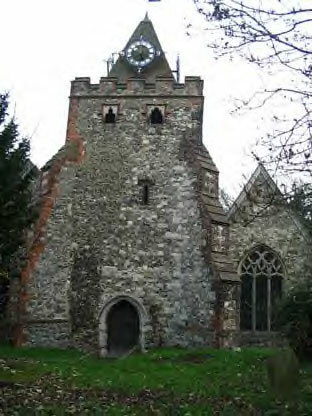 It was recorded that Bishop de Glanville (1185-1214) did great deal of restoration as did Bishop Haymo Hythe (1319-1352). At times when the Black Death ravaged the country there were frequent changes of clergy, some of which could be attributed to this cause. The list of clergy during the Sixteenth Century also reflects the changes in the national church. Henry VIII broke away from Rome and his son, Edward VI, was an ardent Protestant. Between 1515 and 1534 there were four clergy. Did they still adhere to the Catholic faith and so resign or were removed? Mary I, an ardent Catholic, came to the throne in 1553 and in that year Thomas Bedlowe was deprived of the living, but on the succession of Elizabeth I, Protestant, he was restored. In 1670 the Census showed that: “In Halling there are no papists and no non-conformists.” The first registers begin in 1735. It is thought there had been earlier ones but they had been lost or destroyed. BY the middle of Victoria’s reign the village had begun to change resulting in the restoration and enlargement of the Church. Throughout the Middle Ages, the Reformation and later years the population of Halling remained stable. In 1801 the population totalled 248. By 1881 this had increased to 1,273. The Church was not large enough. The Vicar, Rev. Frederick Goldsmith and the Churchwardens contacted Hubert Bensted, Architect, of Maidstone. In March 1886 he submitted an estimate to widen the two aisles, put a new roof on the tower, erect a chancel screen, make new pews and execute other work for £2,100. This would make accommodation for 314 persons in the nave and 30 in the chancel. Rev F. Goldsmith left for Australia in 1888 leaving his successor, Rev G. P. Howes to oversee the work. The Church was closed during 1887-8 for the work to be done and reopened with a special service in February 1888. Soon afterwards a new porch was added together with the organ chamber and vestry. Photographs exit showing the interior of the Church before the extensions were added. The Great War (1914-18) and the Second World War (1939-45) were the most far-reaching events of the Twentieth Century. One look at the War Memorial will indicate how many local families were bereaved. As the village grew, the number of church-goers dropped. To maintain one priest for one parish was becoming less and less viable so that when Rev. George Adams retired in 1976 he was not replaced. Instead Halling and Cuxton were joined to become one ecclesiastical parish and Rev. Graham Lacey was appointed as the first Rector of the united benefice. The building again needed some considerable maintenance work so that, in 1983, under the leadership of Rev. Alan Vousden and Churchwardens Joan Charlton and Gladys Stevenson, a Mediaeval Fair was held. Necessary repairs were carried out, the south aisle adapted for a meeting room and toilet and kitchen facilities were added. The village is still growing in 2004. The difference now is that the new residents are not mainly employed in local industry but commute to London and other towns. What of the future? At present the congregation is small. Our little Church has been a witness to God’s love for some 1,200 years and if it is His Will it will continue for many years to come. What a colourful and light place the early church would have been. Not only would much of the walls be covered with paintings depicting biblical scenes, but there would have been statues dotted around, each with its lighted candles. Wills of C14, C15 & C16 give evidence of money or goods being left to provide lights (candles) to burn beforeL the High Altar, the Rood, the Blessèd Virgin, St John the Baptist, St John and St Peter. For example, in 1515 a cow is left “to provide alight to burn on the rood from the second peal to matins and till high mass is done and from second peal to evensong.” To the worshippers it must have been a place of mystery and reverence, every word of the mass being in Latin must have made it more so. IN the early 1940s the previously uncovered wall painting above the chancel arch (8) was cleaned and repaired by Mrs Baker A.R.C.A. It is thought to date from C12 and is attributed to Michaelis although probably a number of monks from Rochester were involved. It is part of a Passion Series. On the left can be seen The Crowning of our Lord with the Crown of Thorns an on the right The Washing of the Feet and lower down The Last Supper. The four stained glass windows are all the work of C. E. Kempe one of the best designers and colourists of the late Victorian period. His work can be identified by the device of a wheat sheaf. The lancet window in the north wall of the chancel (11) is dedicated to St Barnabas in memory of Rev. J. Nalson Vicar for 33 years (1852-85). The East Window, with three lights, (12) Nativity, Shepherds and Kings, was erected in 1892 in memory of Rev. Francis John Lambert who died aged 25 only three weeks after his ordination. In the south wall of the chancel the lancet window (14) is dedicated to St John the Baptist in memory of James M. Formby. The West Window, with three lights, (20) was provided by a bequest in the will of Rev. C. P. Howes, Vicar from 1888-1889. He oversaw much of the Victorian restoration work, was very involved in village life and was particularly interested in work with the children of the parish. The lychgate (24) was built at his personal expense. Both of the Halling brasses have unusual features. That of John Collard, 1491, (9) shows no effigy but has as its centrepiece a graphic depiction of the five wounds of Christ – a much favoured mediaeval symbol. John had been a clerk of the King’s exchequer. Above the pulpit is a pitiful reminder of the passing of a young mother, aged 33, who had borne six children. Her first husband, William Dalison, pre-deceased her, the second one being the Kent historian William Lambarde. Her twins can be seen in the cradle beside her four-poster bed. The War Memorial is on the north wall of the nave (3). In the floor on the north side of the altar is a plaque to the memory of Rev. James Thomas Bartley Hollis Trimble (Vicar 1921-54), known as Baggy Trimble and still remembered with respect by older parishioners. In the nave tablets in memory of Mrs Peggy Towers, died 18th March 1831, and Frances Comport, died 2nd October 1921. Also on the floor two others which are too worn to identify. No history of the Church would be complete without a reference to the Bishop’s Palace. Their stories have been linked from the beginning. Gundulf was Bishop from 1077-1108 and was responsible for many building projects including a manor house at Halling and replacing the old wooden Saxon church with a stone building as well as the Bishop’s Palace. In 1184 Gilbert de Glanville entertained Richard, Prior of Dover and Archbishop of Canterbury, but Richard died while in the palace, thought to have been poisoned. Hamo de Hythe was Bishop from 1319-53 at a time when the plague (Black Death) was ravaging Kent. He is reported to have “lost out of his small household 4 priests, 5 gentlemen, 10 serving men, 7 young clerks and 6 pages. Not a single soul remained to serve him.” So too must have the rest of the village suffered. The last Bishop to live in the parish was John Fisher. He is reputed to have entertained Erasmus, the eminent Dutch theologian, there. Bishop Fisher was executed in 1535 by Henry VIII as was his friend Thomas More. The building was subsequently leased to Robert Deane. After his death, the property passed to his daughter, Sylvestre, who married first William Dalison by whom she had two children and then, in 1583, William Lambarde, but she died in childbirth in 1587, aged 33. (See Lambarde brass (6).) William Lambarde is remembered for his Perambulations of Kent and is reputed to have been a favourite of Queen Elizabeth I. She deemed him a very handsome man. The palace later became a workhouse and then a farmhouse but finally fell into disuse and then ruin. The last fragment of the wall can be seen on the eastern boundary of the churchyard (25). It was restored in 1983. Sources: William Lambarde Perambulations of Kent, Edward Hasted The History and Topography of the County of Kent, C. H. Fielding The Records of Rochester, Kent, Rev. A. I. Pearman Rochester Diocesan Histories, Rev. Lambert Larking Domesday Book of Kent, Professor Everett Continuity and Colonisation, E. Gowers and D. Church Across the Low Meadow, County Archives Maidstone, Strood Studies Centre. Special thanks to Philip Lawrence and Ted Gowers for advice and help. Key to the Plan (available to visitors in Church). 1) Entrance porch – erected 1898/99 to give some protection from prevailing wing. 2) Oil painting The Blessèd Virgin Mary Being Led Away From Calvary. 3) War Memorial. Note the large number named for a small village. 4) Record Book of gifts to St John’s. Note he beautiful calligraphy. 5) Lady Chapel and Book of Remembrance. Note the pictures on the wall on either side of the altar. These came from the old ST Lawrence Chapel in Upper Halling. 6) Lambarde Brass 1539. See paragraph on brasses. 9) John Collard brass (Under carpet). 10) Memorial tablet to James Thomas Bartley Hollis Trimble. 12) Altar and East Window 1892 The Nativity in memory of Rev. Francis John Lambert. 14) Memorial Window dedicated to St John the Baptist in memory of James M. Formby. 16) Organ chamber and vestry 1891 – now choir robing room and kitchen. 17) Possible site of entrance to stairway leading to Rood Loft. 19) Bell tower and access to clock 1898 installed to commemorate Queen Victoria’s Diamond Jubilee. 20) Memorial window Children of the Bible added by a bequest of Rev G. P. Howes recognising of his love of and work with children. 21) Font – Norman and possibly the earliest work in the Church. 22) Portrait of John Fisher, executed aged 77 by Henry VIII, the last Bishop of Rochester to live in the palace. 23) List of vicars and rectors. From 835 AD into the beginning of the 11th century.